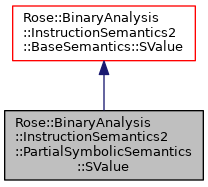 Type of values manipulated by the PartialSymbolicSemantics domain. A value is either known or unknown. Unknown values have a base name (unique ID number), offset, and sign. Definition at line 73 of file PartialSymbolicSemantics2.h. Instantiate a new prototypical value. Prototypical values are only used for their virtual constructors. Definition at line 104 of file PartialSymbolicSemantics2.h. Referenced by bottom_(), create(), number_(), undefined_(), and unspecified_(). Instantiate a new undefined value of specified width. Definition at line 109 of file PartialSymbolicSemantics2.h. Instantiate a new concrete value. Definition at line 114 of file PartialSymbolicSemantics2.h. Insantiate a new value with all the necessary parts. Definition at line 119 of file PartialSymbolicSemantics2.h. Returns a new value that represents bottom in a data-flow analysis. If a semantic domain can represent a bottom value then the isBottom predicate is true when invoked on this method's return value. If a semantic domain cannot support a bottom value, then it may return some other value. Definition at line 126 of file PartialSymbolicSemantics2.h. Create a new undefined semantic value. The new semantic value will have the same dynamic type as the value on which this virtual method is called. This is the most common way that a new value is created. The unspecified_ method is closely related. Definition at line 129 of file PartialSymbolicSemantics2.h. Create a new unspecified semantic value. The new semantic value will have the same dynamic type as the value on which this virtual method is called. Undefined (undefined_) and unspecified are closely related. Unspecified values are the same as undefined values except they're instantiated as the result of some machine instruction where the ISA documentation indicates that the value is unspecified (e.g., status flags for x86 shift and rotate instructions). Most semantic domains make no distinction between undefined and unspecified. Definition at line 132 of file PartialSymbolicSemantics2.h. Create a new concrete semantic value. The new value will represent the specified concrete value and have the same dynamic type as the value on which this virtual method is called. This is the most common way that a new constant is created. The number is truncated to contain nbits bits (higher order bits are cleared). Definition at line 136 of file PartialSymbolicSemantics2.h. Create a new value from an existing value, changing the width if new_width is non-zero. Increasing the width logically adds zero bits to the most significant side of the value; decreasing the width logically removes bits from the most significant side of the value. Definition at line 140 of file PartialSymbolicSemantics2.h. Possibly create a new value by merging two existing values. If you always want a copy regardless of whether the merge is necessary, then use the createMerged convenience function instead. Creates a new semantic value with full control over all aspects of the value. Definition at line 152 of file PartialSymbolicSemantics2.h. Promote a base value to a PartialSymbolicSemantics value. The value v must have a PartialSymbolicSemantics::SValue dynamic type. Definition at line 161 of file PartialSymbolicSemantics2.h. Returns true if two values could be equal. The SMT solver is optional for many subclasses. Returns true if two values must be equal. Print a value to a stream using default format. The value will normally occupy a single line and not contain leading space or line termination. See also, with_format(). Determines whether a value is a data-flow bottom. Returns true if this value represents a bottom value for data-flow analysis. Any RiscOperation performed on an operand whose isBottom predicate returns true will itself return a bottom value. This includes operations like "xor x x" which would normally return zero. Definition at line 182 of file PartialSymbolicSemantics2.h. Determines if the value is a concrete number. Concrete numbers can be created with the number_(), boolean_() virtual constructors, or by other means. Definition at line 186 of file PartialSymbolicSemantics2.h. Return the concrete number for this value. Only values for which is_number() returns true are able to return a concrete value by this method. Definition at line 190 of file PartialSymbolicSemantics2.h. Zero for constants; non-zero ID number for everything else. Definition at line 75 of file PartialSymbolicSemantics2.h. The constant (if name==0) or an offset w.r.t. an unknown (named) base value. Definition at line 76 of file PartialSymbolicSemantics2.h. Switch between name+offset and (-name)+offset; should be false for constants. Definition at line 77 of file PartialSymbolicSemantics2.h.